MechTech talks to Altus Mostert, managing director of Robotic Innovations about the benefits of robot palletizing as a compromise between labour-intensive manual packing, and high-speed dedicated palletizing machines. 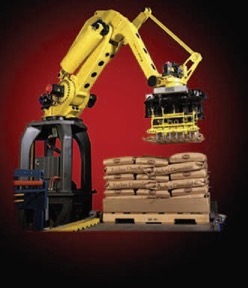 The robot-based system can run up to 1 200 bags per hour. But a robot system costs about 2.5 times less. Robotic Innovations was established in 2004 by Altus Mostert, a robotic systems integration and automation specialist.. The company designs, manufactures and develops solutions for turnkey robotic and automation systems for a number of manufacturing applications. Expertise includes robotic welding, palletizing, painting, trimming, machine tending and complete conveying and handling solutions. “We take pride in offering a quality service that is both flexible and adaptable,’ says Mostert. “ Our creative designers, experienced programmers and skilled engineers create solutions for the South African market, based on South African factory conditions, to provide automated solutions that are cost effective and easily maintained,” he says. Driving the move towards automations in the packing and palletizing industry, Mostert tells us that costs and demand are key. “Medium sized plants have to go for automation in order to remain competitive while still expanding,” he suggests. Describing a typical blending and packing plant, Mostert says that the delivery of dry-bulk powders, including ordinary Portland cement, fly ash and limestone are at the starting point of the process. These are then blended into different cement powders, packaged in 50kg bags, and stacked onto 40 bag cement pallets in eight layers of five bags each. Each pallet is then wrapped, ready for storage and transportation to customers. A loaded pallet is moved onto an intermediate station, which feeds a Beumer stretchhood wrapping machine. On leaving the blending process, the cement powder is first fed into a rotary bag filling machine on elevated platform, which dispenses the correct weight of cement into each bag. The bags are then sealed and as much cement dust as possible is vacuumed off. The filled bag is then dropped onto the conveyor and moved down to ground level. Once there, the bags pass over a scale for weighing, the dust is blown off and the date is printed onto each bag in order to meet SABS requirements. “Date printing is the starting point for us,” Mostert tells Mech-Tech. “It is the first operation of the new robotic palletizing systems that we have begun to install and commission for the cement industry,” he says. Once printed, each bag of cement is taken up on an inclined conveyor and through a bag shaper, where flattening rollers ensure shape uniformity. “After the shaper, we have two high-speed conveyors and then we have a pick-up conveyor and a robot, all interconnected via a Siemens S7 1200 PLC with HMI,” Mostert explains. 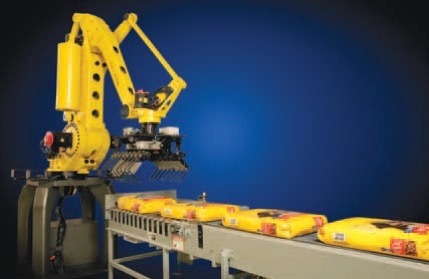 As soon as a bag reaches the end of the conveyor, a signal is sent to the robot via the PLC, instructing the robot to pick up the bag and then pack it, according to a pre-programmed sequence, onto a pallet. A Fanuc M-410 140H high-speed five-axis, dedicated palletizing robot is used. 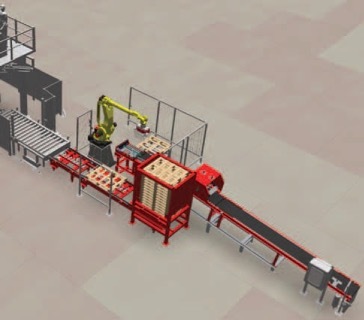 The new robot-based cement palletising systems developed by Robotic Innovations. To keep the robot running continuously, pallets are packed to both sides of the robot. To the right of the robot, sits a loaded pallet stacker that holds 15 pallets and automatically feeds one pallet at a time onto a chain conveyor at ground level. This is moved into place underneath the robot as soon as the previous pallet has been moved on. A loaded pallet is moved onto an intermediate station, which feeds a stretch-hood wrapping machine. The completed pallet is positioned underneath the machine and a plastic hood is stretched from each of its four and pulled over the entire 40-bag of cement: “Most cement companies use this technology, because storage costs money. Stretch hood wrapping is completely waterproof, so it allows for storage outdoors, even in severe weather,” Mostert explains. Prior to the installation of the robot, the palletizing was all done manually by up to 16 labourers, who had to left each bag off the conveyor and load it onto a pallet. “It is very hard work and difficult to get economical volumes or a perfectly packed pallet,” he notes. “Conventional high speed palletiser can run up to 3 000 bags per hour, whereas our system can run up to 1 200 bags per hour. But a robot systems costs about 2,5 times less, and it is more reliable,” Mostert informs MechTech. A Fanuc M-410 140H high speed five-axis, dedicated palletising robot is used. Also, surprisingly, the finished pallet from the robot-based system looks even better than those produced by the cement producers on high-speed conventional systems. “Typically, our clients are those that differentiate themselves from other blenders in terms of volumes and quality, but their bags always used to look the same as the rest. Now, by installing our new robotic palletiser and a stretch-hood wrapper, the pallet appearance is as good as it gets,” he claims. Very low maintenance and ease of use are also major drivers for the selection of robotic palletisers. The cement environment is very harsh and dust hangs in the air for long periods of time. If allowed to settle, it accumulates and, if it gets wet, it will set. Also, if it gets into grease, it creates an excellent grinding paste. Robots, because they are so well mechanically sealed, handle the environment exceptionally well. At one local plant, since installing the robotic system, production capacity is up by more than 35%. “Cement plants that adopt this solution can expect to pay off the capital outlay, via additional throughput and cost savings, well within a year,” Mostert tells MechTech. “All in all, the solution can transform the working environment at cement blending plants into a very simple one,” he concludes.